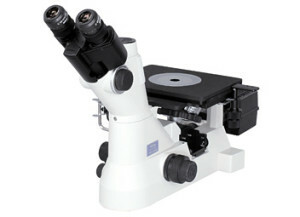 The ECLIPSE MA100/MA100L is a compact-size inverted microscope. It was developed for brightfield observation and simple polarizing observation. Thanks to its compact, durable design and simple operation in addition to its high-contrast observation and image capture, it is excellent for metallographic and electronic components as well as use at production sites in the materials fields and quality control departments. The LED illumination type MA100L is also available. The newly developed MA100L is equipped with a high-intensity maintenance-free LED lamp that has a low power consumption of only 3 watts. The LED lamp provides a uniform image with stable color temperature, regardless of changing light intensity. MA100 is equipped with a high-intensity 6V30W halogen lamp that provides images with natural colors by regulating brightness. CFI60-2 objectives have evolved from the CFI60, recognized for its high NA and long working distance, and now offer the longest working distance and optimum chromatic aberration correction in a body that is lighter than ever. Up to five objective lenses can be mounted.